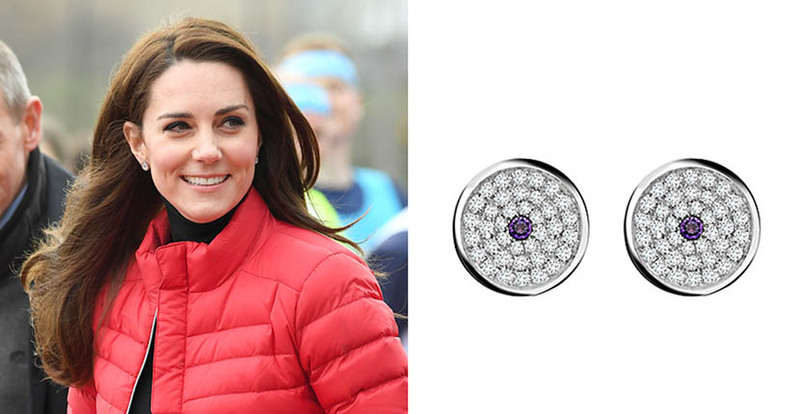 Kate Middleton is not known for wearing statement jewelry. She rarely dips into the royal collection unless she is jeweling up for a very important occasion and even then she has been known to, well, dress down the pieces in her own unique way. Yet she is never without a few diamonds. For official daytime appearances, she favors delicate pendant earrings from her own jewel box. When the occasion is casual, she often goes to a pair of interesting studs. 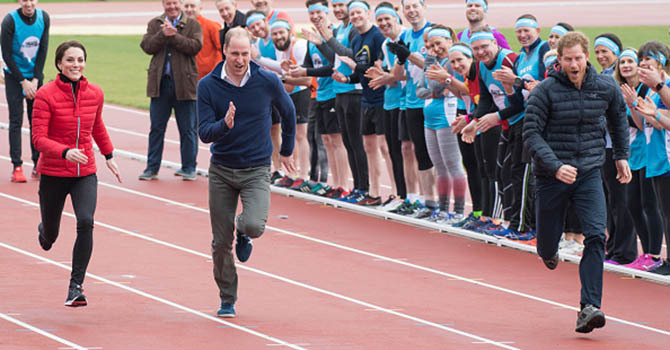 On Sunday in London the Duchess of Cambridge did just that. When she attended a training day for runners participating in the London Marathon with Princes William and Harry, she sported a red down coat, black skinny jeans, sneakers and diamonds from the Asprey. The pavé diamond and white gold 167 Button earrings feature a small amethyst at the center. The colorful accent is in keeping with other pieces in the Kate’s jewelry collection. She has several pieces set with purple or blue stones that coordinate with her sapphire and diamond engagement ring. The earrings and, of course, the celebrated engagement ring both sparkled as the Duchess gamely ran the 100-meter dash against William and Harry at the event.